How to be a good SalesPerson? Articles and updates on sales techniques that can you can use to help you increase your sales results. 5 Tips for Financial Advisers to Improve their Results! Are you a fresh financial adviser starting out on your career but having no idea how to start? Or are you an ambitious financial adviser working very hard each day but just do not seem to achieve a satisfactory result? From my experience and observation, successful financial advisers seem to share some similar characteristics. These common traits of the very top agents in the industry can serve as a guide for amateur advisers, while at the same time provide some insights and advises for other agents seeking to improve their results. Read on to find out what are the 5 tips they have got to offer for advisers looking to join their ranks. Start first by setting a goal of what you wished to achieve in a year's time. Then break up this goal into smaller short term objectives to serve as milestones which seems easier to achieve and can encourage you along the journey while they are continuously being met. Say for example if you hoped to obtain an annual income of $30,000 from policies sales commissions, you will have to earn $2,500 a month from the sales commissions. Usually this will means needing to close about 5 insurance policies in a month. So how are you able to achieve that? If 1 in 4 prospects in face-to-face meet-up will be willing to purchase a policy from you, you will then have to fix-up 20 appointments with potential prospects in a month. Let's say if 1 in 3 prospects in your cold calls would be willing to meet up with you, you will then have to cold call to 60 prospects in a month, which is also equivalent to cold calling to 3 clients a day if you are working only a 5-day work week. Setting goals and targets serve as a guide to help you plan your schedule and daily tasks list. Try to discipline yourself to follow your planned schedule relentlessly, even though if it seems like it is not producing expected results initially. You may want to start from your family members, relatives and friends. They have known you in person for years, and will naturally believe in you and trust that you will be doing a great job for them. When you are attending ex-classmates or ex-colleagues gatherings, re-build the relationships with your long-lost friends. Distribute your name cards and introduce to them what you are doing. There is no need to be shy and afraid. Let people be aware of you and profession, and how you are able to help them with your expertise and financial advice. Attend relevant trade shows, functions and conferences that are related to your industry, and get to know more people of related professions in your industry. You will never know when needs arise when you will require each other's expertise and field of knowledge. Be sure to dress professionally when you are meeting your clients. Make sure your hair is neat and tidy, well-shave and appropriately attired, so as to leave a good first impression. Avoid being sloppy and looked untidy which made him seems insincere and not ready to take up the project. A prospect is more likely to trust an adviser who dress and look presentable, and know that the adviser appreciate and respect the meeting with him. Always be prepared before meeting your clients. Find out a little more about him, such as his age, gender, career and income, single or with a family, smoker or non-smoker, and hopefully what policies had he already purchased. Think of a few options of what he is lacking and will possibly purchase from you. What are the coverage, premiums and returns that he will be getting for each options. And What are the available add-on that he may add for the options. When your client is impressed by the homework that you had done, he will likely be more convinced that you will handle his case in a quality and more professional manner. Your learning do not stop after you had gotten your adviser licence. Or rather, that marks the beginning of your learning experience in your career. Always have a willingness to learn mentality, and keep yourself updated on news and changes that is related to your industry. Are there new changes to the rules and regulations governing your industry and how things will be working differently now? How will the changes affect you or your clients, and are the changes beneficial or not desirable? Are there new products released in the markets? How have the prices of your competitors' products adjusted as compared to yours? As you build up your knowledge through continuous education, you may then slowly establish yourself as an expert in your industry. Attend talk shows and seminars as a guest speaker and share your knowledge and professional advice to those in need. Submit articles to recognized publications and magazines in your industry. Gain public awareness and recognition as being an expert. It is also advisable to obtain professional certification such as the Chartered Financial Consultant (ChFC) or the Million Dollar Round Table (MDRT) to improve your credentials and demonstrate your expertise in this industry. It is advisable to follow-up with your existing customers regularly. This include responding immediately to every calls and queries from your clients. Submit your clients' claims promptly and ensure a smooth and painless process for your client. Do send out regular newsletters informing your clients on new updates and changes relevant to your industry. To strengthen good relationship with your clients, you may want to sent out well wishes to them during festive seasons or on their memorable occasions such as birthday and wedding anniversary. Conduct frequent reviews on your clients' financial status at least once every or 2 years. This will give them a top-of-mind awareness about you whenever they or their friends and relatives have a need for your products and services. Do ask for referrals and testimonials from your satisfied customers. 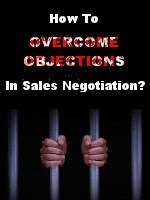 How to Overcome Objections in Sales Negotiations? Getting a "NO!" from your prospects are parts and parcels of sales presentations which most amateur salespersons painfully dread. Instead of being defeated by these common obstacles, learn how you can handle clients' objections tactfully, and turn them to your advantages in sales negotiations with clients. In the midst of negotiation with your prospect or during your sales presentation, there are bound to be times when you will be at odds with your prospect. You, as the salesperson, would like to close the deal quickly while your prospect might be uncomfortable with some aspects of the proposal and would like them to be addressed first. These objections that your prospect might have in their mind, if not handled properly and with care, could hurt the relationship that you had so painstakingly trying to build. Or in a worse case scenario, the prospect might even call off the deal totally. How can you overcome the objections that your prospect might have in a negotiation? I personally propose doing it in the Empathize => Probe => Clarify approach. Instead of ignoring the prospect's concerns and start to get defensive which so many amateur salesperson tend to do, a more appropriate approach would be to acknowledge them. Too many a times's amateur salespersons "win the arguments, but lose the sales". Salespersons should understand that most often than not the prospect is only having objections with the proposal, and is not being personal with the salespersons himself. You do not have to agree that the prospect is right or wrong, but you can agree that you understand his viewpoints. Try to put yourself in your prospect's shoes and empathize with their thoughts and feelings. Let him be aware that his benefits and interests are of the utmost priorities in your heart. "I understand how you are feeling! Others had thought the same way too, but they looked at this differently after they realized that ... "
Listen to your prospect's objections carefully. Give them a chance to explain clearly what exactly the thing that is bothering him, and understand his objections completely. You might want to repeat the key points of his message back to him, so as to make sure that you do not misunderstand him, but also to show that you had understood his concerns. "I see, you are concerned about the ..."
Address the issues at hand that you had identified immediately. Emphasize on the benefits that your prospect will be getting. Explain to him how the benefits and added values can easily outweigh the price or costs that he will be paying. Paint a picture in his mind how he could be enjoying the benefits after he committed to the purchase. Should your prospect remained hesitant, show him some statistics or competitors comparison chart to demonstrate that what you are offering could probably be the very best that is offered in the market. You might also want to show him testimonials or feed-backs of some of your satisfied customers to make him feel more comfortable. Check back with your prospect again if his objection had been fully addressed before moving on. Once his concerns had been addressed, you may then continue with your presentation or proceed to ask for action or close the sales. "Have I answered your concerns?" How to Ask Good Questions in Sales Negotiations? How to Ask Good Questions in Sales Negotiation? - Knowing how to ask good questions in sales presentations and negotiations to achieve a desired outcome and objective is what distinguished an experienced sales professionals from amateurs. Learn this useful techniques and significantly enhance your sales results! In a sales presentation or negotiation, what usually differentiate a good salesperson from a amateur salesperson would be the ability to ask good questions. By asking good questions, it allows a two-way exchange of valuable information and participation with the prospects, rather than a plain and boring delivery speech of the product or service. A good salesperson ask questions not only to understand his prospect better to build stronger relationship, but also seek to discover what is the actual need of his client and if his product could be the perfect fit to his prospect's requirements. Avoid asking close-ended "Yes" or "No" questions, but open-ended questions which allow your prospect the opportunity to elaborate and reveal more information. Below are some of the broad categories of questions that a good salesperson might ask to achieve his aim and objectives. These are questions salespersons asked to find out more about his prospect's characters, hobbies, likes and dislikes, so as to find a common interest he has with his prospect to build a relationship with him. 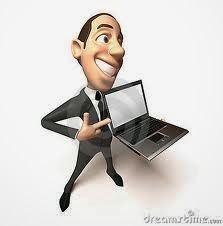 They also help in displaying the salesperson's genuine interest in him and what he is doing. "Wow that's a fine fishing rod that you have over here! Do you like fishing? How often do you go fishing?" "Hey there's 2 beautiful kids in the photo! Are they your kids? How old are they?" Sales-related questions allow a salesperson to ask about his prospect's previous purchases of similar products, be them from his company or competitors, which can help him to gain insights into his prospect's buying behaviors and habits. A salesperson can also be asking questions about details with regard to this particular sale he is dealing with, so as to understand better his prospect's requirements and budgets. "I see that you had purchased 2 policies from us before. Would you mind sharing with me what are your experiences with them? Was it good or bad?" "What are the things you are looking for? Which are more important to you?" "What is your budget for this project?" These questions seek to clear out any doubts that might be around, so as to avoid any potential confusions or misunderstandings that could occurred. They can also be used to extract out more information from your prospect should he replied a brief and unclear answer. Sometimes these questions are also asked to reiterate some important points that a salesperson wished to emphasize. "Help me understand, could you elaborate more on ..."
These questions are used by salespersons to find out the exact and true concerns that a prospect might have that are holding them back from committing to the purchase. Only after the true objections are identified and addressed can the salesperson move his prospect a step closer to close the deal. "Do you have any concerns so far?" "May I know what is holding you back?" "If money is not an issue here, would you ..."
Sometimes when a prospect is hesitant and not ready to commit, it is always helpful for a salesperson to nudge or encourage his prospect a little bit by asking some Ask-for-Action questions. These questions are asked to propose for a close and go ahead with the project implementation, or at least to fix up an appointment for the next discussion to sort out further details. "Do you have any further concerns? If not, I suggest that we move on to ..."
"Now since we have this sorted out, why don't we ..."
"Would you agree that ..."
HubPage Article - "How to Ask Good Questions?" Slideshare Slides - "How to Ask Good Questions?" How to Build Rapport with your Prospects? Learning the powerful and must-know technique which experienced sales professionals used to strengthen relationships with their clients. Rapport is a close and ambiance relationship between 2 or more parties, in which the group of people feel similar with each other and can communicate well with one another. It is displayed in mutual attention, mutual understanding and coordinated behaviors. Building rapport with prospects is deemed as one of the most powerful and fundamental sales techniques, which is used by experienced salespersons to build strong relationships with their prospects, and allow them to gain trust and influence quickly and effectively. Mirroring is one of the common tactics used to build rapport with your prospect, by matching your body language, emotions, tone of speech and behaviors to that of your prospect. Notice his sitting posture, relaxed and cross-legged or sitting up straight, leaning forward or backward? Did he do any gesturing while speaking? If he leaned forward and indicate interest while conversing, you might want to follow suit too to show your interset. Match the tone and volume of his voice. Should he cracked a joke and started to laugh out loud, you might want to laugh out loud too. However, take cautious care not to overdo this excessively, as you do not want to give your prospect an idea that you are parroting or mocking him. It is important to keep an eye contact with your prospect when you are conversing with him, as it a basic social etiquette to do so and it is considered rude not to maintain eye contact to who you are talking to. Also, wondering eyes sometimes indicate a lack of interest with your client and topic, or might convey a sense of untruthfulness in your words. This is the technique of deliberately finding something in common with your prospect, such as a shared interest, common likes or dislikes, with the aim of building a sense of camaraderie and trust. If you find that your prospect likes fishing which is also one of your hobby, talk to him about it or suggest a fishing trip together. If you find that he has 2 kids, probably you can share with him your experiences, both good or bad, that you had with your own children. Conservation of a common interest allow you to go deeper into the topics with your prospects, providing more value-added contents and depth into the conservation. Giving gifts or doing someone a favor will sometimes trigger a feeling or obligation to return the favors, though you do not directly ask for something in return. Abraham Maslow proposed in his paper "A Theory of Human Motivation" back in 1943 that human needs can be broadly categorized into 5 distinct levels. The most fundamental level of need being at the bottom, and higher levels progressively up to the top. He suggested that human will try to fulfill the most fundamental and basic needs at the bottom first, before he would feel a desire to achieve the higher levels of needs. Though human minds are complex and complicated by nature, and the likelihood of human trying to meet different levels of needs at the same time is possible. 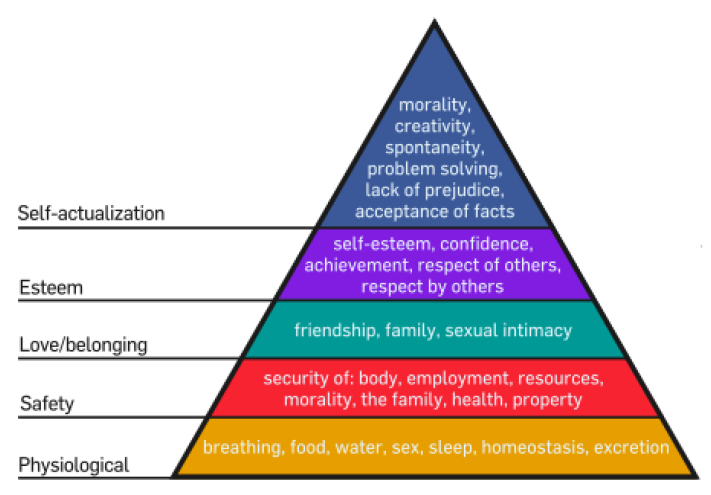 Maslow's theory of the 5 levels of human needs remained a very popular model even till today, and is widely used in sociology and psychology research, as well as management and sales training. These are the physical elements required for human survival, which include air, water, food and shelter. These needs are met in all developed countries and most developing countries, except in some third-world countries distraught with civil war-fares, political unrest or unexpected natural disasters. Sexual needs are sometimes classified in this category. Beer and perfume industries often use attractive models in their advertisements to cater to the sexual appeals of their potential customers. This refers to a need of safety of their possessions and the ability to protect what they had already achieved after their basic or physiological needs are met. Humans require a need of safety of their lives, health and well-being, and also a protection against illness and unforeseen accidents, which is often applied in marketing strategies by insurance companies. In addition, human also seeks to attain financial and job security against potential loss of jobs and bank accounts protection. This next level of need after security and safety refers to the need to feel a sense of belonging and acceptance among their family, friends and social circles of working colleagues, religious groups and sport teams. People who do not participate in social activities actively often feel lonely and rejected. Teenagers from broken families often did things not in the most appropriate ways hoping to seek acceptance among his group of friends. This refers to humans having a need to feel respected and valued by others. People often engage in a profession or hobby which allows them to contribute, and strive to climb up to the top of the corporate ladder and social status to gain recognition among others and peers. Others seek to gain fame and glory to fulfill this innate need. People who failed to achieve their goals in this aspect sometimes lead to low self-esteem or inferiority complex. This refers to one's desire to realize his fullest potential, and to accomplish the maximum that he can possibly do, to be the best that he can be. This often leads to people trying to seek the true meaning and purposes of his life. Some find the answer in his faith and religion, while others believe in helping others and giving back to the society. There are also people who prefers to contribute their efforts to the environment, endangered species, plants and animals. A useful guide of using market segmentation to maximize your marketing efforts and identify potential prospects. What is Market Segmentation? And how it can helps in my marketing efforts? Market Segmentation, by definition, is a marketing strategy of sub-dividing a broad market into identifiable smaller group of consumers who share a common need and characteristics, and will respond similarly to a marketing action. By focusing your attention and efforts on this targeted segment of the broad market, it allows you to be able to design your product or service to better match the needs and desires of your prospects, and also to plan out a more effective marketing campaign that can better reach out to your targeted audience. Is the market size of your targeted segment big enough for you to justify your cost of marketing to promote your product to this group of customers? If you are targeting a very niche market, for example, providing tailored costume to cosplay hobbyist (people who dressed and put on accessories to represent a specific character from manga or anime), is the market demand large enough to absorb your product and for you to have an acceptable profit potential? How is the purchasing power of your targeted customer profile? Do they have a stable and regular income? Which income group do they belong to? For example, if you are selling collectible figurines from popular manga or movies, students who are still schooling may not have the budget to purchase the items from you. A better idea would be to promote to young working adults who have the financial ability to support their younger days passions. How can you reach out to your targeted audience with your marketing message? Are they easily accessible through a certain delivery medium? Is there any magazines or publications that this group of customers will often read? Is there is, putting up a flat advertisement in these publications would be a good idea. Do they frequent a certain location or shops? If that is the case, a signboard advertisement in these area could be a viable option. Are your targeted customers young and tech savvy? If yes, you might probably want to promote your products through internet marketing or social media marketing to reach out to them. Can the results of your marketing efforts easily measured and quantifiable? It will be good if the results can be measured against the marketing costs incurred, and to check if there is any way you can fine-tune the marketing efforts to make it more effective and more cost efficient. Are your group of customers in an already established market segment and much market information and characteristics are known about them? Or are they a new market niche waiting for you to venture into and there is a general lack of information about them? Is the cost of marketing research you plan to conduct justifiable? Is your targeted market segment stable and consistent, and is likely to remain so for the next 10 years or more? Or is there going to be a likely change in the short term due to economical or political changes. For example, low to middle-income group customers in a fast developing country may be getting more affluent quickly, and that might likely change their spending habits and behaviors. Is your targeted customers residing in areas that are prone to political unrest or unexpected natural disasters? These can damage the economic structures adversely and as such affect the inherent behavior of your market segment. Place - Where are you going to sell your product or service that is the most convenient for your targeted market segment to access. Are you going to sell them through an open shop or store, or would you be distributing them to re-sellers or franchisers? 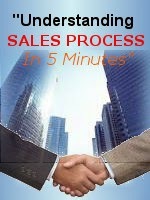 "Understanding the Sales Process in 5 Minutes" - Learning a simplified step-by-step flow of sales activities from clients prospecting to deals closing, and watch how your results can be elevated! Thoughout my years of experience dealing with clients and sales, and my past encounters with remarkable sales professionals who are the very best in the industry, I had come to the observation that most sales follow a general pattern and process. 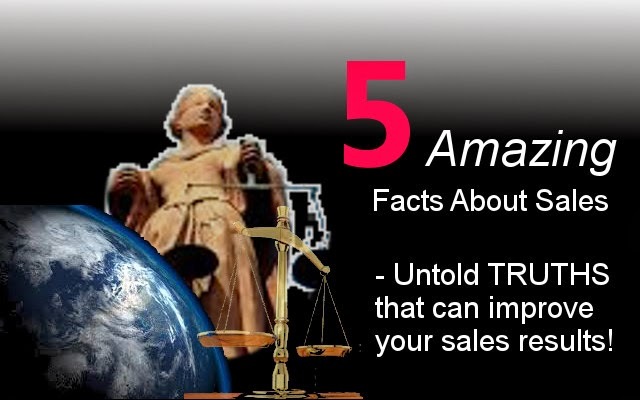 Most sales, if not all, follow these similar series of stages in the process, named the Sales Process in this article, irregardless of the price and type of products. There are only slight variations to the process due the wide variety of products and services in the market, and the varying characteristics and preferences of individual salespersons. It is recommended that salespersons use this Sales Process as a guide, fine-tuning it slightly to suit each individual's products and objectives, and adopted the system to see how it can improve your sales results significantly. Not everybody is going to buy your product or service. There is bound to be a group of people who are more likely to have a need for your product and will purchase it as compared to the general public. Who are the customers that had already bought your product? Do they share a common traits? or do they fit into a specific demographic profile, such as living in a certain area, their age group or gender? By qualifying your prospects who have a higher probability of doing business with you, you are able to better make use of your time and effort while meeting with them. 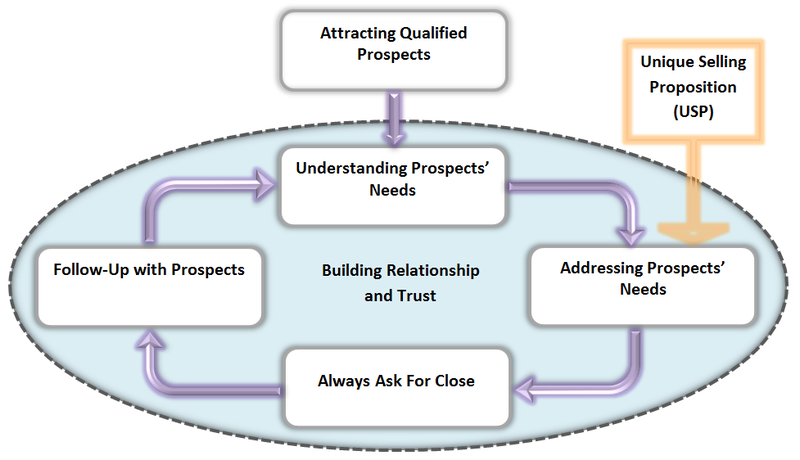 Building good relationship and trust with your prospects is a very important step in the Sales Process. If you failed to gain your prospect's trust, you will never get him to close the deal no matter how attractive your proposal seems to be. This is because he is likely to suffer a huge loss should anything happen. Trust takes many years to build, but takes a moment to be destroyed. As such, it is advisable to always to be truthful to your clients, and not do anything that might hurt your reputation. As once the trust is broken, you might never be able to re-build it again. This is the most important stage in the Sales Process, but also the most overlooked one. How many a time had we seen or heard salespersons trying to push a product or service to prospects without first trying to truly understand the actual needs of the prospects. A prospect will not buy a product which he do not need, no matter how cheap the product is. After understanding your prospect's need, how is your product or service able to fulfill that need? Paint a picture in your prospect's mind how he is able to enjoy the benefits of your product after he had purchased it. If a client can see how your product is able to solve his problem or meet his needs, it will be easy for him to make the decision to commit to the purchase. If you are selling a product and service that are similar to what others are already offering in the market, why must your prospects buy it from you? What makes you different and stand out from the crowd? Unique Selling Proposition (USP) is a marketing strategy that successful campaigns used to differentiate their products and services from their competitors'. By establishing your USP that your competitors are unable to provide, you will be able to gain a group of loyal fans who will come back for your products again and again. Most often than not when a prospect is not ready with the purchase, a natural response would be to procrastinate and delay signing on the dotted line. It is advisable for a salesperson in this situation to always ask for action, either to ask for close or for an appointment to the next meet-up. This can help in moving the prospect a step closer to making the final decision. Contacts with a prospects should not stop after the deal is closed, and it is adviceable for a salesperson to follow-up with the prospect after the close. He can always follow-up with the customer by giving him a call or paying him a visit a few days after the close, to check with him if he is satisfied with the product or service or had him encountered any problems or difficulties. Resolve the issues immediately if any. A salesperson can also follow-up with his customers periodically or during festive seasons. This can help to build relationship and increase the number of repeated sales or referrals from his existing customers. Selling will be easy, if your prospect can see that the value he can get from your product is greater than the price he will be paying. Your job as a salesperson would simply be helping your prospect understand how this can be possible. Emphasize on the benefits and paint a picture in your prospect's mind how he could be enjoying the product after commiting to the purchase. Explain to your prospect how the cost savings he can achieve can easily outrun the price he is currently paying. Let him reach a conclusion, which may be a simple decision to make. If 5% of your cold-call prospects become your paying customers, then simply double your cold-call efforts would improve your results by two times. How many times have you heard that sales is just a numbers game. Well, not exactly true. Suppose you are selling luxury bags, you might not want to try your luck with just everybody out there on the street. As students may not have the purchasing power to buy your bag, while men do not have a need for ladies' items. Do you qualify your prospects and assess if they match your targeted customers' profiles? Do so could probably allow you to spent your prescious time more effectively, and save you lots of potential rejections and headaches. "Close the sales as quickly as possible!" Have you heard that piece of advice often from your sales counter-parts and colleagues? Well, according to a survey conducted by the National Sales Executive Association (NSEA), 80% of the sales are closed on the 5th - 12th contact with prospects. This showed that most prospects are usually not ready to commit on the very first meet-up, and will need some time to consider and think the proposal over. They are aware that purchasing on impulse and acting irrationally will often accompanied by regret. Rather than pushing for close at the very first meeting with prospects, a salesperson should instead focus on building good relationship with them, and help them with making the decision when they are comfortable. If you fell ill one day and went to consult a doctor, he will probably prescribe you a medicine and advice you on the amount and timing to consume your medicine for you to feel better. Would you expect the doctor to explain to you how the medicine will integrate into your body after consumption, and how the medicine will tackle the bacteria and virus in your cells? Probably not. Similarly, your prospects are likely more interested in how your products are able to address their problems, rather than how your products was designed and built. You do not need to be an expert and know 100% of its ins-and-outs for you to sell it. Should such a need arise, simply consult your engineers or technical teams and get back to your clients at a later date. I will not deny that price is an important factor to consider before clients commit to a purchase, but it is not the only and primary reason why clients purchased a product. Price-cutting is a common sales tactic for fast-moving undifferentiated commodities goods, which have lots of close substitutes in the markets and face stiff competition from competitors. However luxury goods exist which targeted a different niche market altogether, and catered to a group of customers who are willing to purchase these items for their branding and presumed social status. Customers are also willing to purchase more expensive products which are deemed to have higher quality, especially electronic appliances. Buying a second-rated electronic product may cost them more money in the long run from repair charges, not taking into account the troubles and headaches trying to get their appliances working again. 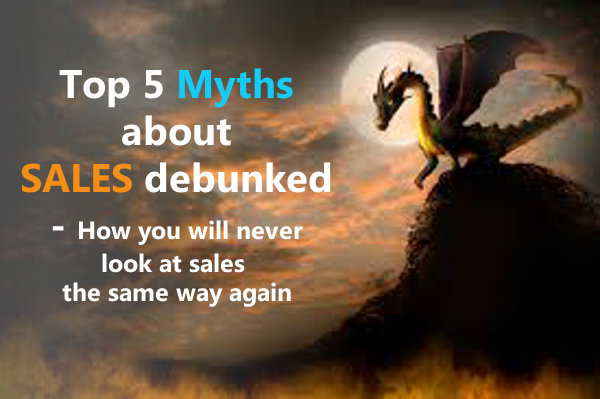 Top 5 Myths about Sales - Why you will never look at Sales the same way again! This is a common generalization, as a typical salesperson usually conjured up in one's mind as a fluent talker who can persuade his prospect into buying at ease. Well, this is not exactly true. However from my past encounters with sales professionals having outstanding track records, they were in fact good listeners who are proficient in discovering the actual needs of their prospects and seek how their products and services are able to address that needs. Clients are more willing to purchase from salespersons who understand what they want, rather than from salespersons who give them a whole day speech on all their products' features. Salespersons who are good talkers may sometimes resort to pressurizing sales tactics and come across to the prospects as hard-selling and a lack of concern towards them. Myth #2 - I would not be able to sell the product well, as even I myself would not buy that product. This sounds logical, as it would seem unethical to try to sell to a prospect something that even the salesperson himself would not purchase. However on a deeper thought, different people have different views and opinions due to different upbringing, environment, knowledge and experience. The salesperson is judging the product on behalf of his prospect based on his own perspective rather than trying to looking at things in his prospect's position. As the saying goes, one man's meat is another's poison. Something that a salesperson deems useless might be just the exact solution his prospect has been searching for. The salesperson in this case should try to look at the same thing from different angles and see if his opinions can be justified. A good salesperson can sell anything to anyone. If he cannot do that, then he is not good enough. Haven't the saying goes "A great salesperson can sell ice to the eskimos"? Well not really, in my opinion. You simply just can't force somebody to buy something that he doesn't need from you, can you? If you happen to have an alternative in your range of products to offer, you might want to see if that might fit into the prospect's requirements. Otherwise, a better strategy would be to move on to another prospect who might be in a position that needs your product more. Never push your product through hard-selling, which will annoyed your prospect. It might hurt your relationship with him, and you lose all future opportunities to do business and deals with him. Should you display a high level of enthusiasm in your product, your prospect will get influenced by you and started to get all excited in your product too! No, that is not true. Your prospect does not care about how you feel or what you do. What matters most to him is how your product is going to do for him! Rather than presenting to your prospect enthusiastically about your product's features, simply explain to him the benefits he can get from your product would be an better option. No, the customer is not always right. He might be proficient in his profession but he cannot possibly know everything that is under the sun. A doctor will be able to carry out an operation on a patient perfectly, but he might not be aware of the latest changes in financial planning or tax structuring. You, being in your line of work and frequently receiving updates and market news on a daily basis, is in a better position to offer your prospect professional advices with your relevant experience and expertise. Helping your prospect understand his situation better will be part of the value-adding services that you can provide. Starting a business requires a large sum of initial capital, and is considered high risk in nature.Accordingly to a statistical research from Entrepreneur Weekly done in July 2013, 1 in 4 businesses failed within the first year of starting up, and 50% of businesses in all industry failed within the first 4 years. A business owner needed an entretreneur spirit and strong determination to pull through in times of difficulties to succeed. Similarly, investment requires large capital to have significant returns. Income potential - A sales job offers such a high income potential that few other professions can provide. While a typical employee received a fix monthly salary, a sales representative earn commissions based on his performance. The more sales you can close, the higher would be your pay check and bonus, which means the sky is the limit. Sales is a highly rewarding career provided you know how to do your job well. Flexible hours - You are flexible working hours and are fully in control of your own time. You plan your own schedule and decide what you will be doing for the day as you deemed appropriate. As long as you delivered the results that is expected of you, you are free to do what you want. Of course, with this freedom it requires a strong self-descipline and time management skills on your part in order to excel at your job. Important soft skills - Working in sales allow you to develop important soft skillsets that are very useful in your future career path. 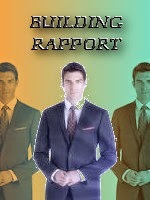 A salesperson learned to be confident and present a professional image in front of clients. He will have good communication skills that allow him to interact well and build good relationship with other people. A good salesperson learned how to accept rejections, and over time develop valuable attributes such as the determination and perserverance to overcome challenges and difficulties. Job security - Sales and revenues are the life-blood of maintaining a business. In times of difficultes, there is only so much to cut costs and expenses, but without sales, a business will find it hard to continue to survive. Knowing this, a good salesperson who can sell well can never be redundant. A sales professional who are able to demonstrate a good track record of successes is well sought after by all companies in most industries, and he will seldom find himself out of a job. Interesting job scope - A salesperson will has an interesting work, as he gets to travel to different places and meet different people of varying status everyday. A sales job is ideal for those who enjoy travelling, and those who find themselves bored working as nine-to-five desk roles. Sense of accomplishment - Sales is not really about forcing people to buy your products, but rather to discover how your product is able to match to someone else's needs. As such, salesperson seek to achieve that, and often feel a sense of accomplishment when they managed to establish that win-win scenario. Not to mention the additional commissions and bonus that they will get. to receive updates and articles posted on this blog! Copyright 2013 GoodSalesperson. Simple theme. Powered by Blogger.